Eight prominent Pakistani exporting companies will participate in Fine Food Australia Exhibition at the International Convention Centre Darling Harbour Sydney from 11-14 September 2017. Pakistani companies participating in this exhibition specialise in exporting Rice, Seafood, Juices, Frozen food (potato bites, spring rolls, samousas, parathas, Salt, Spices, Pulses, Dates, Dry Coriander, Ajwain, Halva, Rusk, Nimco, Frozen Fruit and Vegetables etc. Local Australians and Pak community members visited the Pakistani companies showcasing their products at the Pakistan Pavilion and appreciate quality of “Made in Pakistan” products. 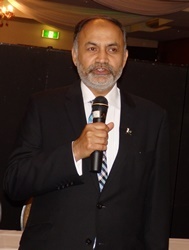 On Tuesday, 12th Sept 2017, The Consul General of Pakistan / Trade Commissioner of Pakistan in Sydney Mr. Abdul Majid Yousfani hosted a dinner for Pakistani delegation. The dinner was held at the Spice of Life Restaurant, Harris Park Sydney and also attended by prominent Businessmen of Australia. The Host of the event, Mr Abdul Majid Yousfani welcomes all guests & explained details/ importance of the 2017 Fine Food Exhibition Sydney Australia. All overseas businessman and local guests introduce themself briefly. Pak delegation thanks for Consulate General of Pakistan in Sydney for coordinating and facilitating the visit of the business delegation from Pakistan and connecting them with Australian companies, buyers and wholesalers. They appreciated warm hospitality of Consul General Mr Abdul Majid Yousfani and Trade Development Officer Mr. Asad Jatoi. The Members of Delegation said that they participates lot of International Exhibitions/ trade display in different countries but if we compare Guidance & Facilities than we can say on oath that in Australia we get better coordinating from the humble efficient CG and staff of Pakistan Consulate Sydney.